There are several challenges in managing continuous corn as far as tillage is concerned. Residue management, seed placement, nitrogen (N) application, and equipment attachments are a few of the challenges to consider. Residue presents management problems, particularly with conservation tillage and no-tillage used in continuous corn production. There will be a significant amount of residue buildup with continuous corn, which requires a different approach in terms of tillage system and equipment needs. The impact of tillage, coupled with a mono-cropping system, will be significant on soil and water quality, in addition to potential yield decline. Residue management and tillage system. Managing residue with continuous corn largely depends on what kind of tillage system will be used. The most challenging system will be no-tillage with continuous corn. No-tillage systems have both advantages and challenges concerning the management of crop residue. One of the main advantages of this system is that it leaves significant amounts of crop residue on the soil surface, protecting the soil from water erosion and improving soil tilth. Conversely, these significant amounts of residue pose a challenge of their own: How to manage residue as part of a no-tillage system. To ensure the success of no-tillage, farmers need to use a system approach in the management of residue. This involves the integration of planting, nutrient application, and harvesting processes. While each of these components is important, there are things to consider in managing crop residue in a no-tillage system. The success of managing residue in continuous corn, particularly with no-tillage, depends on using the right equipment from planting to harvest, in addition to the proper methods of managing residue on the field. upright residue can provide better protection to the soil surface from wind and water erosions by reducing wind and water flow near the surface. Given these reasons against chopping corn residue, no-tillage can be managed efficiently without affecting yield. Residue amount and distribution of residue during harvest. While cutting residue after harvest is one technique for managing crop residue, it is possible to avoid this step altogether. This can be accomplished by calibrating the combine properly to ensure a uniform residue distribution on the soil surface. A few adjustments and fine tuning of a combine prior to harvest can pay off significantly in having uniform residue cover across the field. Fall N application for residue decomposition. Research showed that fall N application did not consistently increase residue decomposition. Sometimes fall N application can furnish N to stimulate residue decomposition in N-deficient environments (soil). The success of managing residue in continuous corn, particularly with no-tillage, depends on using the right equipment from planting to harvest in addition to the proper methods of managing residue on the field. Removing residue for any purpose needs to be balanced with the potential impact on water and soil quality. Extensive tillage has a negative effect on soil carbon. Tillage can increase soil erosion and reduce water quality. Extensive tillage can cause a decrease in aggregate stability and soil structure. Tillage can reduce soil infiltration and increase surface runoff. Tillage can increase soil compaction and limit root development. 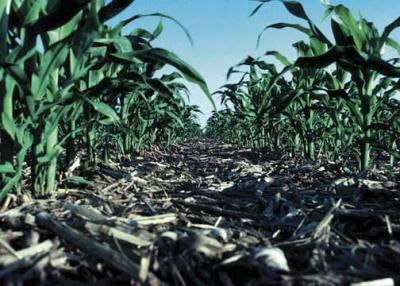 Increased residue cover plays a significant role in moderating soil temperature. Adequate residue cover reduces soil evaporation and conserves soil moisture. High residue cover in a cold environment and poorly drained soils may reduce early seed germination, especially with no-tillage. This article originally appeared on pages 22-23 of the IC-498 (1) -- February 12, 2007 issue.